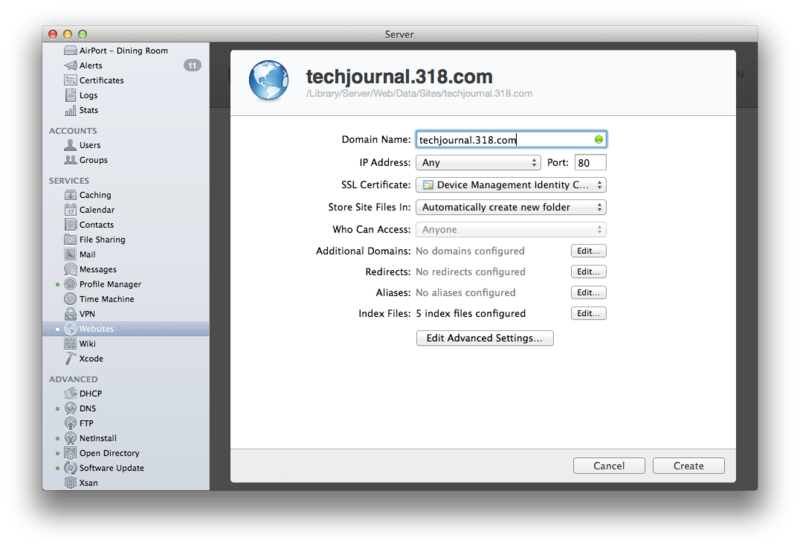 Once you’ve configured all the appropriate options, click on Done to save your changes. The site should then load. Sites are then listed in the list of Websites. The Apache service is most easily managed from the Server app, but there are too many options in Apache to really be able to put into a holistic graphical interface. 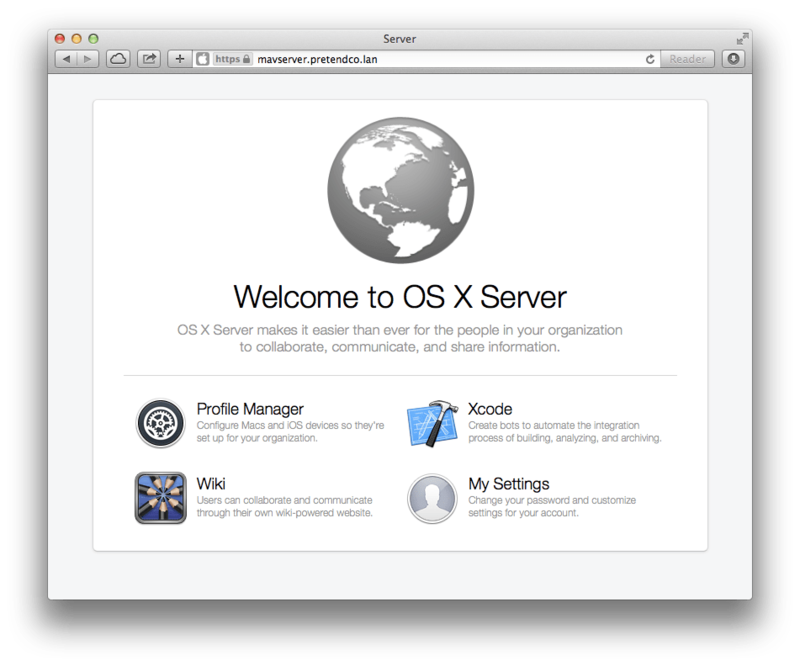 The easiest way to manage the Websites service in OS X Mavericks server is using the serveradmin command. Apache administrators from other platforms will be tempted to use the apachectl command to restart the Websites service. Instead, use the serveradmin command to do so. To start the service: sudo serveradmin start web To stop the service(s): sudo serveradmin stop web And to see the status: sudo serveradmin fullstatus web Fullstatus returns the following information: web:health = _empty_dictionary web:readWriteSettingsVersion = 1 web:apacheVersion = "2.2" web:servicePortsRestrictionInfo = _empty_array web:startedTime = "2013-10-08 01:05:32 +0000" web:apacheState = "RUNNING" web:statusMessage = "" web:ApacheMode = 2 web:servicePortsAreRestricted = "NO" web:state = "RUNNING" web:setStateVersion = 1 While the health option typically resembles kiosk computers in the Computer Science departments of most major universities, much of the rest of the output can be pretty helpful including the Apache version, whether the service is running, any restrictions on ports and the date/time stamp that the service was started. 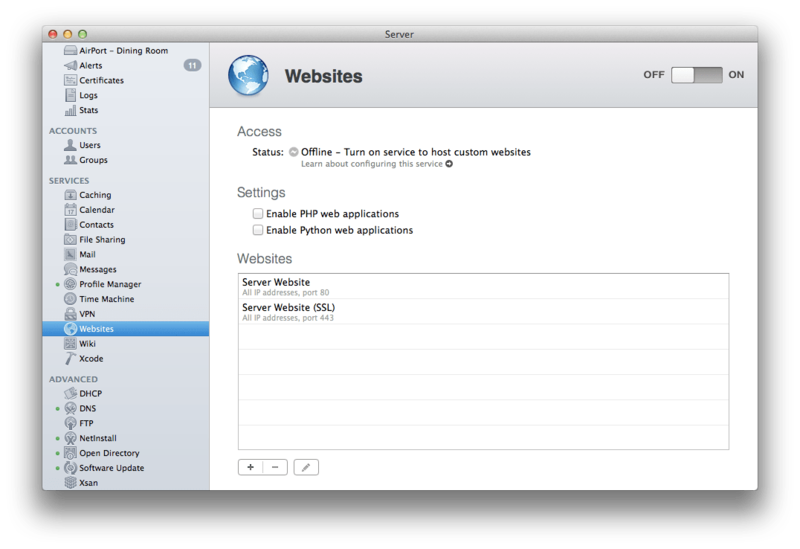 To see all of the settings available to the serveradmin command, run it, followed by settings and then web, to indicate the Websites service: sudo serveradmin settings web The output is pretty verbose and can be considered in two sections, the first includes global settings across sites as well as the information for the default sites that should not be deleted: web:defaultSite:documentRoot = "/Library/Server/Web/Data/Sites/Default" web:defaultSite:serverName = "" web:defaultSite:realms = _empty_dictionary web:defaultSite:redirects = _empty_array web:defaultSite:enableServerSideIncludes = no web:defaultSite:customLogPath = "&quot;/var/log/apache2/access_log&quot;" web:defaultSite:webApps = _empty_array web:defaultSite:sslCertificateIdentifier = "" web:defaultSite:fullSiteRedirectToOtherSite = "" web:defaultSite:allowFolderListing = no web:defaultSite:serverAliases = _empty_array web:defaultSite:errorLogPath = "&quot;/var/log/apache2/error_log&quot;" web:defaultSite:fileName = "/Library/Server/Web/Config/apache2/sites/0000_any_80_.conf" web:defaultSite:aliases = _empty_array web:defaultSite:directoryIndexes:_array_index:0 = "index.html" web:defaultSite:directoryIndexes:_array_index:1 = "index.php" web:defaultSite:directoryIndexes:_array_index:2 = "/wiki/" web:defaultSite:directoryIndexes:_array_index:3 = "default.html" web:defaultSite:allowAllOverrides = no web:defaultSite:identifier = "37502141" web:defaultSite:port = 80 web:defaultSite:allowCGIExecution = no web:defaultSite:serverAddress = "*" web:defaultSite:requiresSSL = no web:defaultSite:proxies = _empty_dictionary web:defaultSite:errorDocuments = _empty_dictionary web:defaultSecureSite:documentRoot = "/Library/Server/Web/Data/Sites/Default" web:defaultSecureSite:serverName = "" web:defaultSecureSite:realms = _empty_dictionary web:defaultSecureSite:redirects = _empty_array web:defaultSecureSite:enableServerSideIncludes = no web:defaultSecureSite:customLogPath = "&quot;/var/log/apache2/access_log&quot;" web:defaultSecureSite:webApps = _empty_array web:defaultSecureSite:sslCertificateIdentifier = "com.apple.systemdefault.9912650B09DE94ED160146A3996A45EB3E39275B" web:defaultSecureSite:fullSiteRedirectToOtherSite = "" web:defaultSecureSite:allowFolderListing = no web:defaultSecureSite:serverAliases = _empty_array web:defaultSecureSite:errorLogPath = "&quot;/var/log/apache2/error_log&quot;" web:defaultSecureSite:fileName = "/Library/Server/Web/Config/apache2/sites/0000_any_443_.conf" web:defaultSecureSite:aliases = _empty_array web:defaultSecureSite:directoryIndexes:_array_index:0 = "index.html" web:defaultSecureSite:directoryIndexes:_array_index:1 = "index.php" web:defaultSecureSite:directoryIndexes:_array_index:2 = "/wiki/" web:defaultSecureSite:directoryIndexes:_array_index:3 = "default.html" web:defaultSecureSite:allowAllOverrides = no web:defaultSecureSite:identifier = "37502140" web:defaultSecureSite:port = 443 web:defaultSecureSite:allowCGIExecution = no web:defaultSecureSite:serverAddress = "*" web:defaultSecureSite:requiresSSL = yes web:defaultSecureSite:proxies = _empty_dictionary web:defaultSecureSite:errorDocuments = _empty_dictionary web:dataLocation = "/Library/Server/Web/Data" web:mainHost:keepAliveTimeout = 15.000000 web:mainHost:maxClients = "50%" The second section is per-site settings, with an array entry for each site: web:customSites:_array_index:0:documentRoot = "/Library/Server/Web/Data/Sites/www2.krypted.com" web:customSites:_array_index:0:serverName = "www2.krypted.com" web:customSites:_array_index:0:realms = _empty_dictionary web:customSites:_array_index:0:redirects = _empty_array web:customSites:_array_index:0:enableServerSideIncludes = no web:customSites:_array_index:0:customLogPath = "/var/log/apache2/access_log" web:customSites:_array_index:0:webApps = _empty_array web:customSites:_array_index:0:sslCertificateIdentifier = "" web:customSites:_array_index:0:fullSiteRedirectToOtherSite = "" web:customSites:_array_index:0:allowFolderListing = no web:customSites:_array_index:0:serverAliases = _empty_array web:customSites:_array_index:0:errorLogPath = "/var/log/apache2/error_log" web:customSites:_array_index:0:fileName = "/Library/Server/Web/Config/apache2/sites/0000_any_80_www2.krypted.com.conf" web:customSites:_array_index:0:aliases = _empty_array web:customSites:_array_index:0:directoryIndexes:_array_index:0 = "index.html" web:customSites:_array_index:0:directoryIndexes:_array_index:1 = "index.php" web:customSites:_array_index:0:directoryIndexes:_array_index:2 = "/wiki/" web:customSites:_array_index:0:directoryIndexes:_array_index:3 = "default.html" web:customSites:_array_index:0:allowAllOverrides = no web:customSites:_array_index:0:identifier = "41179886" web:customSites:_array_index:0:port = 80 web:customSites:_array_index:0:allowCGIExecution = no web:customSites:_array_index:0:serverAddress = "*" web:customSites:_array_index:0:requiresSSL = no web:customSites:_array_index:0:proxies = _empty_dictionary web:customSites:_array_index:0:errorDocuments = _empty_dictionary The final section (the largest by far) includes array entries for each defined web app. The following shows the entry for a Hello World Python app: web:definedWebApps:_array_index:20:requiredWebAppNames = _empty_array web:definedWebApps:_array_index:20:includeFiles = _empty_array web:definedWebApps:_array_index:20:requiredModuleNames = _empty_array web:definedWebApps:_array_index:20:startCommand = "" web:definedWebApps:_array_index:20:sslPolicy = 0 web:definedWebApps:_array_index:20:requiresSSL = no web:definedWebApps:_array_index:20:requiredByWebAppNames = _empty_array web:definedWebApps:_array_index:20:launchKeys:_array_index:0 = "org.postgresql.postgres" web:definedWebApps:_array_index:20:proxies = _empty_dictionary web:definedWebApps:_array_index:20:preflightCommand = "" web:definedWebApps:_array_index:20:stopCommand = "" web:definedWebApps:_array_index:20:name = "org.postgresql.postgres" web:definedWebApps:_array_index:20:displayName = "" Each site has its own configuration file defined in the array for each section. By default these are stored in the /Library/Server/Web/Config/apache2/sites directory, with /Library/Server/Web/Config/apache2/sites/0000_any_80_www2.krypted.com.conf being the file for the custom site we created previously. 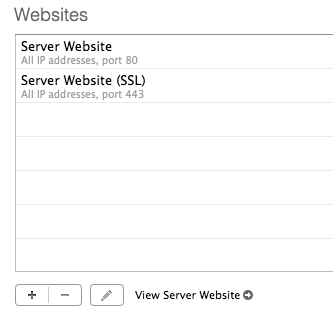 As you can see, many of the options available in the Server app are also available in these files: <VirtualHost *:80> ServerName www2.krypted.com ServerAdmin admin@example.com DocumentRoot "/Library/Server/Web/Data/Sites/www2.krypted.com" DirectoryIndex index.html index.php /wiki/ default.html CustomLog /var/log/apache2/access_log combinedvhost ErrorLog /var/log/apache2/error_log <IfModule mod_ssl.c> SSLEngine Off SSLCipherSuite “ALL:!aNULL:!ADH:!eNULL:!LOW:!EXP:RC4+RSA:+HIGH:+MEDIUM” SSLProtocol -ALL +SSLv3 +TLSv1 SSLProxyEngine On SSLProxyProtocol -ALL +SSLv3 +TLSv1 </IfModule> <Directory “/Library/Server/Web/Data/Sites/www2.krypted.com”> Options All -Indexes -ExecCGI -Includes +MultiViews AllowOverride None <IfModule mod_dav.c> DAV Off </IfModule> <IfDefine !WEBSERVICE_ON> Deny from all ErrorDocument 403 /customerror/websitesoff403.html </IfDefine> </Directory> </VirtualHost> The serveradmin command can also be used to run commands. For example, to reset the service to factory defaults, delete the configuration files for each site and then run the following command: sudo serveradmin command web:command=restoreFactorySettings The final tip I’m going to give in this article is when to make changes with each app. I strongly recommend making all of your changes in the Server app when possible. When it isn’t, use serveradmin and when you can’t make changes in serveradmin, only then alter the configuration files that come with the operating system by default. I also recommend keeping backups of all configuration files that are altered and a log of what was altered in each, in order to help piece the server back together should it become unconfigured miraculously when a softwareupdate -all is run next.